England’s Katarina Johnson-Thompson claimed heptathlon gold at the Commonwealth Games – her first major outdoor title. The 25-year-old led after the first day and then went 31cm clear of the rest of the field in the long jump. She threw over 40m in the javelin and safely negotiated the 800m to win gold ahead of Canada’s Nina Schultz. England’s 18-year-old Niamh Emerson won the 800m to climb from fourth place and take the bronze medal. Immediately after Johnson-Thompson completed victory, South Africa’s Caster Semenya dominated the women’s 800m to add another gold to the 1500m she won on Tuesday. In clocking one minute 56.68 seconds, Semenya set a Games record, just as she did in winning the 1500m. England’s James Arnott won silver in the men’s T57 100m, but their men’s 4x400m team did not make it through the morning heats after Matthew Hudson-Smith pulled up with a leg injury. Johnson-Thompson, the reigning world indoor champion, had never before won a global senior outdoor medal. The Liverpudlian was sixth at the 2016 Rio Olympics, where her performance of 1.98m in the high jump would have been enough to win gold in the individual event. She has been widely tipped to follow in the footsteps of Olympic champions Denise Lewis and Jessica Ennis-Hill since winning gold at the World Youth Championships in 2009 but has been hampered by weaknesses in the throwing disciplines and, at the 2015 World Championships, had three no-jumps in the long jump after lying second to Ennis-Hill overnight. In winning the Commonwealth crown, however, she has at least claimed a title that eluded Ennis-Hill. Sitting on the track after crossing the finish line, her tears suggested she had aggravated an injury in completing the 800m and she later confirmed a calf problem. “Everything’s OK,” Johnson-Thompson told BBC Sport. “I was nursing an injury going into day two. I’m just happy I made it over the line; there was no way I was stopping. 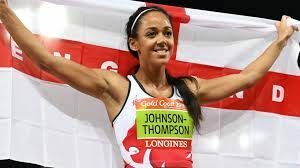 Johnson-Thompson’s team-mate Emerson is two years younger than Ennis-Hill when she took Commonwealth bronze in Melbourne in 2006. Needing to make up around eight seconds on Australian Celeste Mucci in the 800m, Emerson streaked ahead to win the race by more than five seconds and come home some 27 seconds ahead of home athlete Mucci – also just 18.